The president hosted his counterpart from Ghana, the first country to gain its independence in Africa, this week. 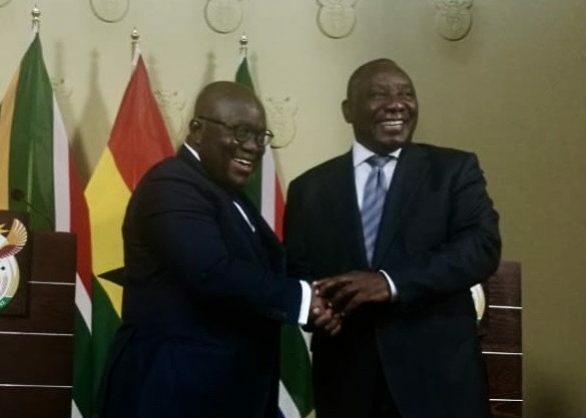 President Cyril Ramaphosa has agreed with his visiting counterpart Ghana President Nana Addo Dankwa Akufo-Addo saying “we concur with your profound statement that the African economic transformation we desire will not come through aid”. The South African president made the remarks a state banquet held during the state visit of the Ghana leader on Thursday night. The president added: “We have at our disposal an abundance of natural and human resources that can be developed and harnessed to put Africa on a path of sustainable economic development. “To do this, Africa has to embrace and participate meaningfully in the fourth industrial revolution to develop our human capital and to beneficiate our natural resources. We must do more to promote intra-Africa trade and investment. Ramaphosa said the decision taken earlier on Thursday to elevate the existing Permanent Joint Commission for Cooperation to a Bi-National Commission at Heads of State level was a “signal of our intention”. Ramaphosa expressed his gratitude to Ghana for its support during the struggle against apartheid. Ramaphosa said: “We have taken to heart his message that there is a constant need for our continent to be unified in pursuit of our common goals. As fellow Africans, we can testify that President Nkrumah’s statement was given practical expression in Ghana’s support for the total liberation of Africa. “Many freedom fighters and political refugees from the continent and the Pan-African fraternity in the diaspora were welcomed in your country with the legendary Ghanaian hospitality as they sought refuge from colonial persecution and apartheid destruction. “These include great luminaries such as Frantz Fanon, George Padmore, WEB Du Bois, Kwame Ture, our very own Mama Africa, Miriam Makeba, and your beloved and abundantly talented friend Hugh Masekela. “They were not just given homes, passports and material support. They were given far more than that. They were also given hope, fortitude and courage to carry on with the fight for freedom,” said Ramaphosa, who revealed that his counterpart would honour former president the late Nelson Mandela, who would have turned 100 years old this month.